•	In 2010, the top hedge fund manager earned as much in one HOUR as the average (median) family earned in 47 YEARS. •	The top 25 hedge fund managers in 2010 earned as much as 658,000 entry level teachers. •	In 1970 the top 100 CEOs made $40 for every dollar earned by the average worker. By 2006, the CEOs received $1,723 for every worker dollar. As the administration and Congress argue over cuts in social programs, inequality in America grows more extreme each day. Even the great financial crash didn't derail this trend. The richest 400 Americans, for example, increased their wealth by 54 percent between 2005 and 2010, while the median middle-class family saw its wealth decline by 35 percent. It's not the result of mysterious global forces, or technology, or China, or structural problems concerning the skills and education of our workforce. Rather, it is the direct result of policy choices made by Democrats and Republicans alike. Together, they swallowed the Kool-Aid of unregulated market mania, and now we are paying the price. In exploring this story for my new book, How to Make a Million Dollars an Hour: Why Hedge Funds Get Away with Siphoning Off America's Wealth , it became clear that New Deal policy makers shared a deep fear that democratic capitalism could not function unless Wall Street was tightly controlled. After all, Europe was sinking into the fascist camp while the new Soviet Union seemed invulnerable to the global depression. As a result, to put it crudely, the New Dealers quickly regulated the hell out of high finance through a myriad of programs including the formation of the S.E.C and Glass-Steagall. The goal was to turn Wall Street into a sleepy place to work, rather than an adrenalin-fueled arena of stock manipulation and fraud. At the same time income tax rates on the wealthy sky-rocketed with top marginal rates reaching over 90 percent. The results were nothing short of stupendous. •	For more than a quarter of a century there were no financial crises anywhere in the globe (except Brazil in 1964). 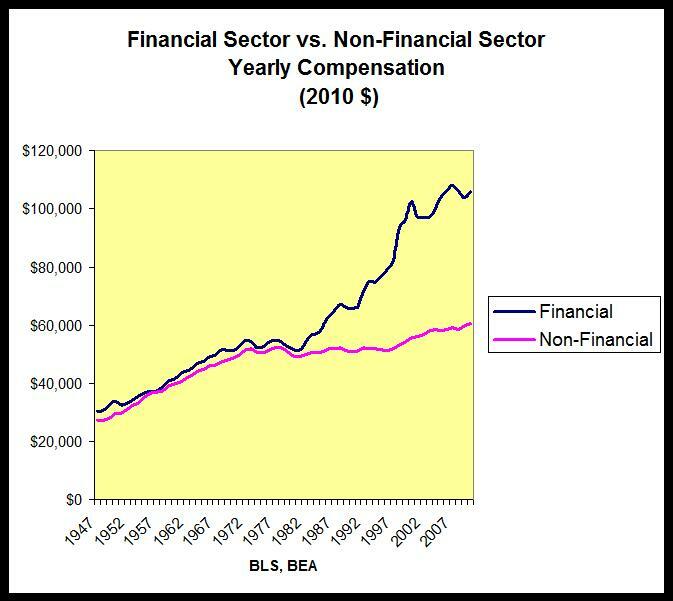 •	The average wage in the financial sector collapsed so that its compensation was similar to the average wage of non-financial jobs. •	Inequality fell rapidly -- the top one percent accounted for more than 23 percent of all income in 1928. By the 1970s it had fallen to less than 9 percent. These policies gave birth to middle-class America, as the average income of working families grew steadily during the WWII period. This was the new America that would out-compete world communism for the support of working people all over the world. After a series of economic mishaps, (largely due, but not limited, to the excessive costs of the Vietnam War and the Cold War), both inflation and unemployment rose simultaneously. This led many economists and policy makers to believe that Keynesian economics no longer applied (meaning that you could not successfully use government spending to combat rising unemployment without triggering excessive inflation.) Neo-liberal economists, led by Milton Friedman, filled the breach by arguing that less government and more free enterprise were desperately needed. In fact, they claimed that the determined pursuit of profit invariable created the most wealth (and freedom) for all. The message was well received, especially by the Reagan administration. Taxes were slashed for the super-rich, (with the blessing of the Democrats, as well.) Unions were suppressed. Regulations, especially on Wall Street, vanished. A boom was to follow to make all boats rise. Wall Street, however, sprung to life. As deregulation increased, so did Wall Street incomes compared to the rest of the economy. With the financial sector leading the charge, non-financial CEOs climbed on board. If 30-year-old traders could make tens of millions of dollars playing financial roulette with other people's money, then why shouldn't CEOs get paid more... and more... and more? "Greed is good" became more than a memorable phrase from a movie. It became a badge of honor -- a sign of recognition among the highest-paid players who knew precisely how to game the system. And then we paid the price with another crash. Not quite as bad as 1929, but close. But this post-crash period is remarkably different. Rather than constraining inequality, the bailouts resurrected high finance and the inequality it inevitably spawns. Instead of putting our foot back on the neck of finance, we're talking about slashing social programs. Rather than dramatically increasing taxes on the super-rich through a wealth tax, we're debating how to slash Social Security and Medicare benefits. One reason our priorities are so favorable to inequality is because most Americans have no idea how skewed our income distribution really is. As Michael Norton and Dan Ariely have demonstrated through their research, over 90 percent of Americans prefer to live in a country with an income distribution like Sweden's. That doesn't mean, of course, that Americans are closet social democrats. Rather, it reflects that they believe America is much more egalitarian than it really is. The Norton/Ariely study builds from an idea developed by philosopher John Rawls in his book, A Theory of Justice. Rawls argues that to create the principles for a fair and just social order we need to take part in a rational but imaginary exercise. We need to imagine ourselves coming together as free and equal individuals to form a compact to create a society. But to engage in our imaginary negotiations, we must do so behind a "veil of ignorance" -- we must have no idea where we would end up in the new society we would be creating. We have to make our choices about the principles of social justice without knowing our individual talents or health or financial resources. So given that "veil of ignorance," what would be our principles of justice? Rawls argues convincingly that we would select two. First, we would only agree to enter a new society if it protected as many of our basic freedoms as possible. And second, we would only permit inequality if it also benefited those with the least incomes and resources in society. For the last generation, our free market ideologues have argued that inequality would trickle down and, in effect, fulfill Rawls' second condition for justice. However their real-time experiment failed. Increasing inequality has not increased the well-being of the poor, or even the middle class. It is by and for the well-to-do. In short, we are unlikely to find a rational or moral justification for increasing inequality. For a brief moment, Occupy Wall Street changed the national discourse away from the insanity of belt-tightening and towards inequality and Wall Street. If we care about justice, we need to find ways to do so again.